This Black Friday = Black Jewelry! Posted on November 25, 2011 at 8:51 am. Shopping at midnight? Pushing and shoving to get in the door? Going straight from Thanksgiving dinner at grandma’s house to the mall? There are all sorts of ways to initiate the holiday shopping season, and at Max’s, Black Friday has taken on a whole new meaning – it’s all about black jewelry! How about a beautiful black diamond ring, a pair of dangling black diamond earrings, or black diamonds woven with gold wire to create this pair of stunning hoop earrings like these from Amali. If diamonds aren’t you’re thing, there are the blackened sterling silver bracelets with brightly colored gemstones, or gold pendants on a black chain or black silk cord, or black rubber necklaces with sparkling pink sapphires. You get the idea – black jewelry is hot and in style this holiday season! Oprah has recognized the trend and we were excited to see that she featured items from two of our favorites — Anne Sportun and Sarah Graham. 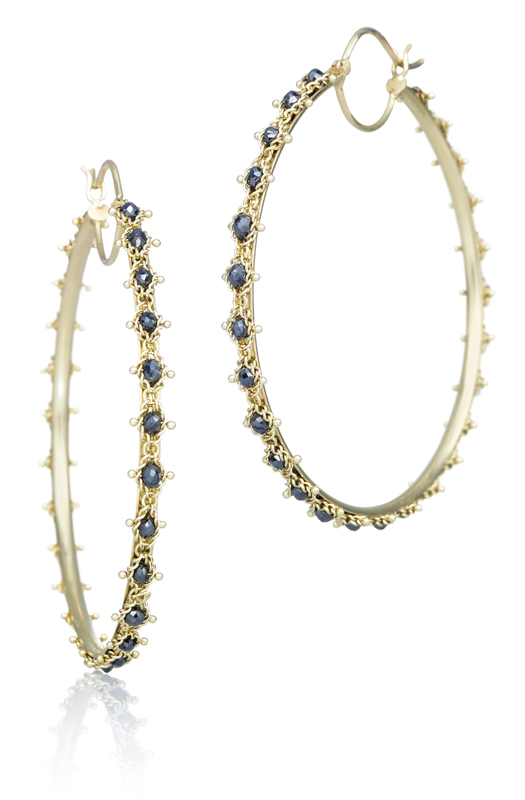 Of course, if you’re not into the whole black jewelry thing, you can make this silver and/or gold Friday too! Either way, I hope that you’ll join us today and throughout the holiday season and let us help you find something special for everyone on your list!